Just dropped by to see if any new pix or video of the Princess. Catch you all later. that is some beautiful colt. Nice conformation, and he's still just a newborn. He thinks he's all that and a bag of chips, and he be right! Union Rags colt. He is something else! Beautiful baby! Sturdy-looking and full of spit and vinegar. Isn't he though? I love the look on his face. Says it all - "I'm here, I look like my Dad, and I can't wait to hit the track". 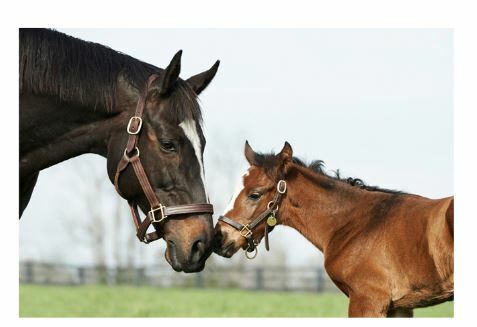 I guess you've seen the pic of his new filly that looks almost exactly like the colt. I've always thought Union Rags was a gorgeous colt. It's nice to see him stamping his foals with his outstanding looks. I think the Union Rags colt is most impressive. His conformation is astounding for one so young. Even at his tender age he has a commanding presence. He should be interesting to follow as he grows. I hope we get lots of new pictures of 14Z soon. IDK about that....Zi has a growing fan base of his own. Count me as one of those! Thank you! I obviously missed it. I thought the new thread for her had been combined with the waiting room. Oh, I think he's one gorgeous baby or should I say "son" now. Sounds crazy but I'm already looking past his racing days to his breeding days. I think he'll be a fabulous sire! But for now, I'm so excited to see more news about him as he grows and matures cause going to John can't be too far away! I know John is SO excited about these babies! They are his Queen's after all. She really is a light bay. Love the shoulder on this girl. That neck ain't shabby either. I like a thicker neck. Secretariat had that powerful neck. Just thrusting his head forward pulled more speed out of the rest of him. Only my opinion. I don't know the 'technicalities' of such things. It just seemed that way to me. Yikes! New picture so I went bouncing all over Z.com to see when it was first posted. It's soooo cute. My little Zilly girl (remember all, this is MY name for her; don't get all excited...). Hope we get more and maybe a vid. Agree, neck and shoulder look good and I love her color. Hope she got some of mom's rear end; one of Z's greatest qualities IMHO. Zi certainly got some. Contest winners for the pic of 14z are Serena and Don. Really? That's so cool! Wonder if they'll name her that? She looked so small in her first photo, that I can't believe she was 151 pounds.